There are hundreds of bamboo species, each with unique and variable characteristics, which can get a little overwhelming. We have condensed the choices to the most practical, versatile and viable species for landscape use in the Pacific Northwest. This page summarizes the cultural differences between clumping and running bamboos, follow the links for specific selections. 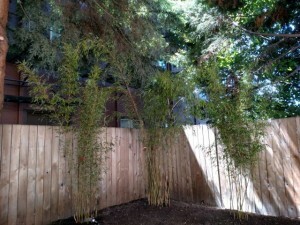 Clumping bamboo needs no barrier or pruning trench containment. It spreads gradually and predictably, increasing in diameter by only inches each year. It has small diameter canes, usually less than 3/4″ wide which grow dense and closely spaced. It has a weeping habit, usually from 6′ tall up to about 15′ tall depending upon the species. They prefer afternoon shade, but a few can tolerate more sun, although they may be more stressed, pale, and shorter than they would be in more shade. They make great screens due to their density, they will grow together to make an impenetrable hedge when spaced between 2′-5′ apart when planted. They can get big and broad over time, but unlike running bamboo which needs annual maintenance, they can go for several years without any need for maintenance. When they start to get too big divisions are made by digging out and removing about 1/4 to 1/3 of the plant. They do not have the large caned structural aspect of their running relatives, but they are more easily managed and have a grace and proportional beauty. Running bamboo should be contained by root pruning, barrier, or a combination of both. 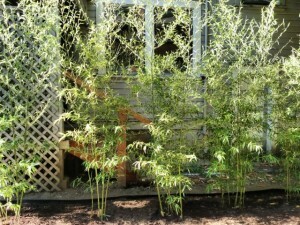 It is the stereotypical tall, large caned bamboo, though it can vary from 1/2″ diameter canes up to 4″+. Typical heights range from 15′ to 25′ tall, with a few over 30′. These are the most upright bamboos, though all can weep to some degree, especially in the rain, or worse; ice and snow, though they usually bounce back up. They like as much sun as they can get, but will tolerate more shade, though they may be shorter and slower to develop with less sun. Running bamboos will quickly grow together to make a dense hedge or grove, taking a couple to several years when spaced between 2′-5′ apart when planted.